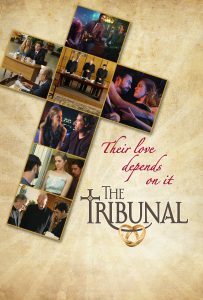 The stakes are much higher than life or death in The Tribunal, a courtroom drama set in a Catholic Marriage Tribunal. On the surface, it appears that the struggle between Tony and Joe, two best friends who both love Emily, hinges on Joe obtaining an annulment of his first marriage, so Emily, a devout Catholic, can marry him. Only Tony can testify to the truth and make the annulment a reality for Joe, but Tony still loves Emily, his ex-girlfriend. In reality, the struggle is for the souls of all three. Tony has been trying to come back to God because he wants Emily, and his heart tells him he has to be the best man he can be for her. Joe doesn't run as spiritually or emotionally deep as Tony, but he loves Emily, too, and he wants to do the right thing. Both Tony and Joe have to decide if they will make the sacrifice necessary to love Emily. She, in turn, must decide whether she truly loves Joe, or Tony. As they each fight for whom they love, the Tribunal slowly answers the ever-present question hanging over the proceedings, "What does God want?" Why it matters to these three is the reason it matters to every person. Our souls will not rest until they rest in the arms of the Lord.